Remember illustrator Jordan Kay? I wrote about her way back when she completed our invite art. 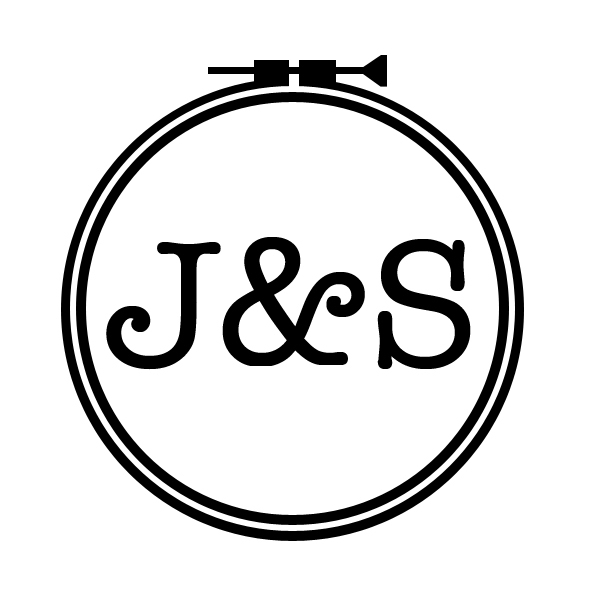 Well, she is still awesome and completed this beautiful logo for Joe and I to transform into a little rubber stamp to stamp our invitations/books/faces/friends/friends’ faces with! I just ordered the stamp from an Etsy shop called mycustomstamps. I’m excited to see how it turns out! Here is a write-up from Madison graphic designer and photographer Kari K about her design process in creating all the print material for an upcoming wedding. Kari does a variety of work with print materials—from graphic design to beautiful and affordable handmade books. Her exploration of the world of print and paper is truly inspiring, and her fun, yet precise work reflects her dedication to her craft. Check out her work for this wedding, and hire her for yours! “In October 2009, Kate and Caleb approached me to shoot their engagement photos and design a customized wedding package for their March 2010 wedding. They wanted an invitation design with a “shabby chic vibe” that would let them incorporate multiple photos of them from their engagement photo shoot. 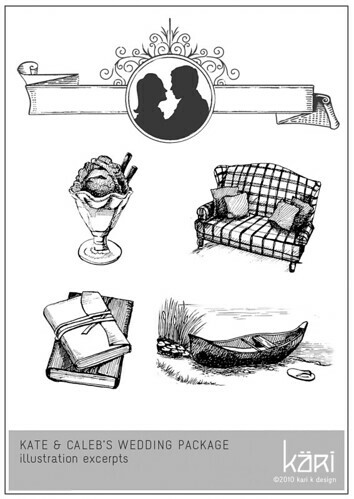 Along with a custom-designed invitation and RSVP postcard, they also requested a wedding program, illustrations of significant stories leading up to their wedding, table cards, name cards, napkin cards, menu cards and signage for the reception. Their wedding in early March 2010 will feature eclectic vintage and antique decor, with brown, gray, peach, ivory, and metallics as the main colors, along with chartreuse accents. My main inspiration was derived from a piece of decorative sheet music from the 1920s. The invitation was key in kicking off the event, so it got a lot of attention. 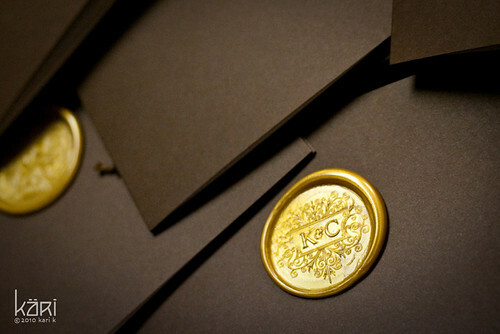 Prominently featured on the cover of the invitation is their customized emblem stamped into a gold wax seal that contrasted with the smooth, chocolate brown paper. This booklet-style invitation allowed them room for the invitation, information for the guests, and two full-page photos from their shoot. The hand-binding added an extra personal touch. Their RSVP postcard featured another photo of them from their shoot and tucked neatly inside the envelope, along with the invitation. Not only do they have distinctive wedding invitations, their custom wax stamp is now theirs to use and enjoy for as long as they like. See more photos on kari k design’s flickr photostream.